Nanoparticles are used in many commercial products catalysts to cosmetics. A review published today in the Science and Technology of Advanced Materials by researchers in Sweden and Spain describes recent work on the 3 main nanoparticles used in photocatalytic, UV-blocking and sunscreens. Nanoparticles are currently used in commercial products ranging from catalysts, polishing media and magnetic fluids to cosmetics and sunscreens. A new review by researchers in Sweden and Spain describes recent work to optimize the synthesis, dispersion and surface functionalization of titania, zinc oxide and ceria – the three main nanoparticles used in photocatalytic, UV-blocking and sunscreen applications. With the commercial success of self-cleaning glass in the window frames of high-rise buildings, there is growing interest in applying photocatalytic, self-cleaning titania coatings on building facades and other construction materials. These coatings not only can keep building surfaces clean but also reduce concentrations of harmful airborne pollutants. The antibacterial properties of photocatalytic coatings also offer a means of managing persistent bacteria, mainly in hospitals. Transparent UV-absorbing or UV-blocking coatings currently have two main applications: as a UV-protecting lacquer for wooden surfaces, and as a UV-barrier coating deposited on the surface of polymer-based products or devices to slow down their deterioration. Published in the journal, Science and Technology of Advanced Materials, this study describes the structural and chemical requirements as well as the various routes for producing transparent photocatalytic and nanoparticle-based UV-blocking coatings and sunscreens. The authors review the main methods for synthesizing titania, zinc oxide and ceria nanoparticles, with a focus on recent research on the generation of non-agglomerated powders. (Agglomeration is often the major cause of poor performance and limited transparency.) The authors also identify organic additives that are efficient dispersants and can improve the compatibility of inorganic nanoparticles with an organic matrix. In addition to discussing the technical performance of nanoparticles, the authors address concerns related to distributing them in the environment. 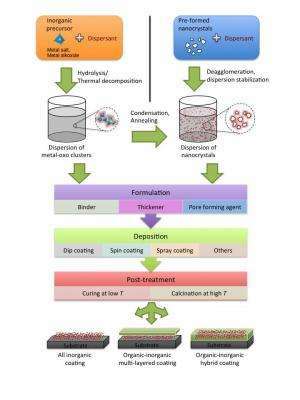 They conclude by describing future prospects for nanoparticles and identifying promising materials, such as multifunctional coatings and hybrid films.